WE BELIEVE AND KNOW THAT GOD CAN MEET US WHERE WE ARE, AND CHANGE ANY SITUATION, AND WITHOUT HIM WE LIVE DEFEATED LIVES. Get your day started off right with Right Thinking. Why? Your thoughts are so important. Your thoughts help frame your day and formulate your outlook on life. Proverbs 23:7 says, “For as a man thinketh in his heart, so is he…” As you awaken each morning, take a hold of your thoughts. Think about what you’re thinking about. Your thoughts are so powerful, they will either help to build you up or they can bring your life down to the ground. Each day, take out time to get a scripture and think on it and begin to speak it over yourself. As you do this, you open yourself up for God to do marvelous things in your life. I have been a part of Redeeming Love Ministries for 16 years. I have witnessed the mighty acts of God that have been manifested since I have been a member. Many have been healed, delivered and set free by the laying on of hands. I am so grateful to be a part of a ministry that teaches holy living and accountability. When I first came to the ministry I knew nothing about having an intimate relationship with the true and living God. I was in a dysfunctional marriage, lived in lack and never knew about the principle of tithing and sowing seed. When my mom was alive, our family got together and laid a seed in the woman of God’s hand, and what the doctors said appeared to be cancer was undetectable. My mom lived a good life even after the miracle. Since coming under the tutelage of my Pastors, I am learning how to apply the word of God to my everyday life. 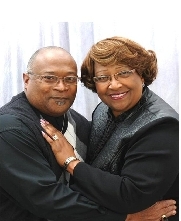 God has manifested and proven himself to me because he has shown me that he’s my healer, peace, provider and husband. I never thought that I could ever own anything or drive a decent car. Well, God has shown Himself to be mighty, He supernaturally put me in my own house, cleaned up my credit, paid off a vehicle, and provided new vehicles for my daughter and me. What a mighty God I serve!!! I just love Him!! !